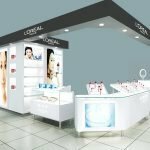 Cosmetic makeup kiosk is very popular in annual. It always popular in any month. 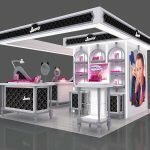 Commonly, the basic material of makeup kiosk is MDF with glossy baking paint. Such as white glossy surface, black glossy surface. However, the surface of this cosmetic kiosk is wood grain laminate—nature style. This style makes a good impression. From the 3D design, you couldn’t see the lights on the top of each wooden pillar. The idea that light can illuminate the cosmetic products to display it. So people will focus on it. And the pillars are well-proportioned. 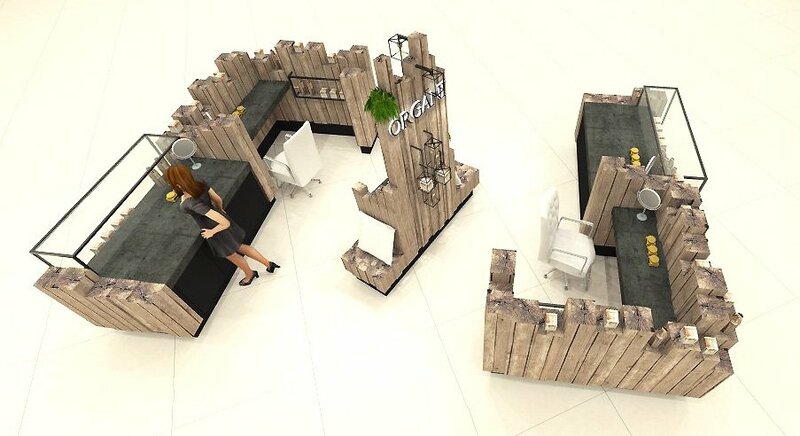 The main display area in this cosmetic kiosk is on the top of wood pillars. Of course, it must match the makeup table for customers test samples, etc. In my opinion, atrovirens table is so good to match the whole theme. If all the external and interior decorate as vintage style, at this time, we could plus some energetic things into it. Such as fake grass. Sometimes, customers would like to add more display area, then we will add some display shelves on the wood walls. Such as glass display cabinet on the back of the makeup table. If the whole kiosk prefer to dark, we suggest do the LOGO with illuminate.